Crow’s Theatre’s production of The Boy in the Moon, currently playing at their stunning new venue Streetcar Crowsnest, opens with a father leading us through a late night struggle to put his son to back to bed. He describes the scene with an off-the-cuff rhythm that makes it seem commonplace, but we soon discover that it is anything but. His son Walker has a myriad of disabilities caused by a rare genetic disorder (CFC), turning this standard domestic task into an adventure full of humour and horror and love. This opening bit sets us up to properly process what life with Walker is like. Nothing here is easy or simple. Just getting him fed and clean can be a grotesque and harrowing ordeal, but it is explained with such patience and compassion that your mind doesn’t just reject it completely. Emil Sher’s play, based on Ian Brown’s memoir of raising Walker with his wife Joanna Schneller and their daughter Hayley, is conversational. All three talk to us directly and frequently correct each other as they feel the truth might be lost in any one person’s intense and overwhelming subjective experience. The text is finely tuned to present just enough detail to make any given moment vivid and compelling, but not so much that you tune-out. Each episode with Walker is complex and layered, even the soothing moments of calm hold the potential for chaos and havoc. I found it profoundly touching, hearing each of these characters express their internal life as they struggle, desperately, to understand his. 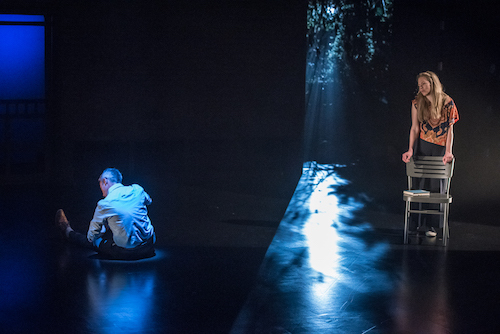 Director Chris Abraham and his design team—Shannon Lea Doyle (set and costumes), Andre du Toit and Kimberly Purtell (lighting)—have crafted an eerie atmosphere full of potential for both crushing alienation and transcendent connection. The stage is, for the most part, vast and empty: a table and chairs in one corner, a small doorway at the back and the slightest hint of a forest in another corner. Life with Walker is so all-consuming that these hints of an ordinary, outside world seem distant and perhaps more unreachable than Walker himself. There is an odd and intriguing circle of light that drifts around the stage aimlessly until, suddenly, mooring itself on one of our three characters. For me, this seemed to represent the intangible consciousness of Walker, drifting along untethered and alone until someone catches and embraces some fleeting essence of him. Remington North’s sparing use of projections helps to fill in much of the expansive surrounding darkness. Even with these purposeful and evocative touches, the performances are the driving force of this show. David Storch and Liisa Repo-Martell are such visceral presences. You can see it clearly in their body language: the awful, swollen burden that threatens to tear them apart, the rousing moments of triumph as they overcome some fleshy and fitful obstacle, and finally…those tranquil, soothing moments of connection that make their whole experience worthwhile. I found Kelly McNamee to be a stabilizing presence. She embodies their almost-overlooked daughter Hayley and a handful of incidental characters that help relieve the weight of processing the intense emotions of our main pair. This story gets right at the heart of why and how we connect to others, the investment we put into those we love that gives them meaning to us. I found The Boy in the Moon deeply moving and can’t recommend it highly enough. The Boy in the Moon plays until May 27, 2017 at Streetcar Crowsnest (345 Carlaw Avenue). Sounds like a heart breaker for parents that attend.